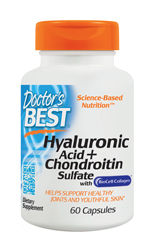 Best Hyaluronic Acid with Chondroitin Sulfate contains patented BioCell Collagen II® (US patents 6,025,327; 6,323,319; & 6,780,841).BioCell Collagen is sourced from chicken stemal cartilage and provides bioavailable, low molecular weight hyaluronic acid. It is standardized to contain 10% Hyaluronic Acid, 20% Chondroitin Sulfate, and 60% Collagen Type ll. Ingredients: (per serving) Hyaluronic Acid - 100 mg, Chondroitin Sulfate - 200 mg, Hydrolyzed Collagen Type ll - 600 mg. Suggested Adult Use: Take 2 capsules daily or as directed by a health care practitioner. Take with or without food. Warning: Not suitable for vegetarians.